The cryptocurrency industry has given birth to a whole host of interesting and useful technologies. One such technology that is making a huge difference in many industries is the blockchain technology. This type of technology facilitates online transactions and it could potentially revolutionize the way that the financial industry operates. 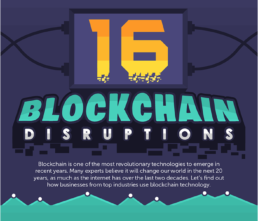 This article and infographic look at what the blockchain technology is and how it is causing disruptions in various industries. Blockchain technology can be used as an online transaction facilitation. This technology uses a public ledger to record transactional data, and the process is sent through a peer-to-peer network. The transactions are encrypted and there are no centralized control or middlemen. Basically, a blockchain transaction is conducted in the following way. The instigating party sends a transaction request through the peer-to-peer network. This transaction request is authenticated on the blockchain public ledger and added to it as a new block of data. This data is then passed through the peer-to-peer network to the recipient and finalized. As you can see, blockchain offers many benefits. Generally, blockchain based transactions are faster, cheaper, and more secure than traditional online transaction methods. What Industries Are Already Using The Blockchain Technology? Currently, the most widespread use of blockchain technology is the authentication of cryptocurrency transactions. This is essentially what makes cryptocurrencies possible, so any person that participates in crypto coin trades, gambles at an online Bitcoin casino or even uses Bitcoin to pay products and services is directly dependent on blockchain tech. Whilst this technology is still in its infancy, it has already progressed hugely and many industries are actually experimenting with it in some interesting ways. Possibly one of the most interesting implementations of the technology is what the government of Sierra Leone has actually this year. It held a blockchain based elections, which created the first-ever public vote that couldn’t be refuted or disputed. Due to the blockchain public ledger, each vote is recorded and there is irrefutable proof of its creation and content. Blockchain technology is also being used in the energy supply industry, charitable organizations, cloud technologies, and even supply chain management, to name a few examples. As this type of technology develops and becomes widely accepted, we should only see an increase in its usage. Furthermore, we should see a greater variety of different uses for the blockchain technology. It is clear that the financial industry must pay heed to it, as it could supersede traditional online payment methods in the future.